Is automation the right move for you? Home News & Events Blog Is Automation the Right Move? by Marc Lobit, General Manager of Sales Support, Mazak Optonics Corp.
A few years ago, it was rare to find a fabrication shop that had implemented automated material handling on their laser-cutting machines. As companies invest to meet new capacity demands for a strengthening economy, a striking trend being seen is the high percentage of new lasers that are being delivered with some type of automation. The reasons companies are so focused on automation varies. Overall, these reasons will often tie to a need to increase capacity in order to meet post-recession customer demand. It may be that they have a limited skilled-worker pool to draw from or a need to meet customer demands to lower the cost on parts in order to increase capacity to reduce delivery times. Most typically there is no single reason, but rather a more complex set of reasons driving the decision to automate. Naoko McIntosh, Automation Specialist, adds, “Advantages of laser automation come in many forms especially with the newest technological advancements. Automation simplifies the loading/unloading, storage of cut material and contributes to the overall productivity of the laser cell”. The benefits that result from a company implementing laser automation are profound. A typical standalone laser is utilized only a fraction of the useable workweek. It sits idle while waiting for setup or material, as well as during lunch breaks and off hours. Owners who track actual laser cut time are almost always shocked to see the reality of the underutilization of such a major asset. Automation systems allow capacity to flex through utilizing lights-out operation without the burden of adding man-power. It also makes one-piece flow more practical, while producing short run efficiencies that will reduce non-value added fabricating time. The bottom line is typically a 50% or greater increase in capacity as compared to standalone machines and significant reduction in lead times. What type of automation do you need? What should your initial configuration look like? What are the challenges you may face implementing an automation system? 1. Do you really need automation? The key benefits to automating a laser process are speed, consistency and capacity. Speed - An operator loading a machine by hand will take about 35% longer than an automated loader. The automatic loader does not get tired and does not take breaks – it is always available. Consistency - The amount of time between each cycle - the load and unload time - is a variable, as long as it relies on human beings. Capacity - A plant that depends on operators to load its machines has to add both machines and people to increase volume. A plant that uses automation can add machines without necessarily adding people. All three key benefits tie to crucial components of lean manufacturing. They reduce rework, reduce the need for inventory, make workflow more consistent and help make production planning more predictable. The key deliverable is quality throughput. In order to determine the specific benefits or justification of automation, you will need to project your near-term and long-term production requirements. This can be done by selecting typical nests for common materials and thicknesses. Next, you need to time-study cutting those nests. Keep in mind that there may be a significant difference in the processing time for older series machines, as opposed to ones with newer technology. Most laser machine manufacturers can help you forecast the cut times. They can also help you with cycle times to change sheets and maintenance intervals to better understand the net impact to throughput. The comparative value of your throughput calculated with standalone machines, including the possibility of adding an additional shift, and utilizing automation will go a long way in calculating the ROI for implementing a system. 2. What type of automation do you need? “There is no ‘one size fits all’ when it comes to automation,” McIntosh explains, “every customer is different and we work to serve each customer as a unique project”. Automation systems can be modular in order to allow for future growth but there are also compact solutions that are made for one machine. Key determining factors for the type of automation you purchase is the number of machines, desired throughput and the amount of variation in material type and thickness. Mazak’s current machine models utilize a shuttle table which is the simplest form of machine automation to increase productivity; however external material handling systems have more significant benefits. The first type focuses on adding a Load/Unload system. 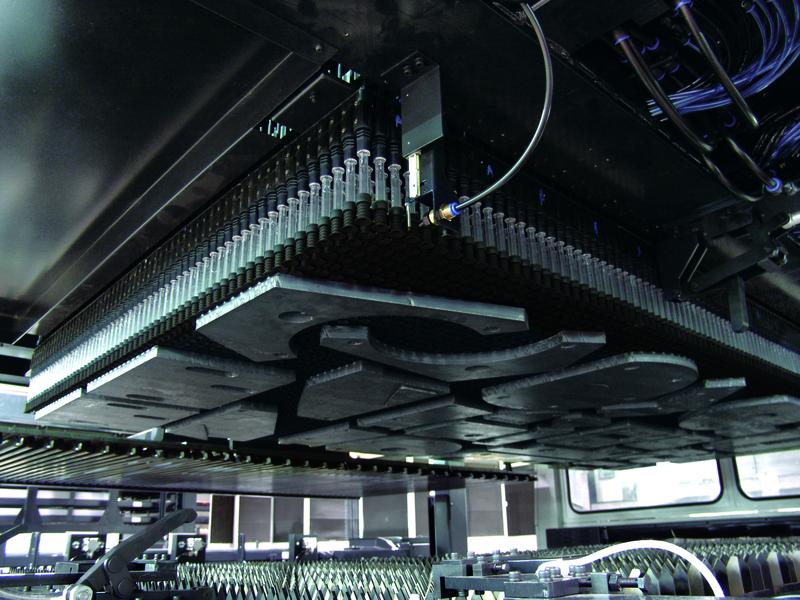 By adding a Load/Unload automation system to a laser-cutting machine enables the system to run unattended (machine paces system) for longer periods of time. It includes a single load, and separate unload table, which limits you to a single material type/thickness at a time. It is most applicable for batch production with fewer material changes, but can typically run 12 hours per day with one manned shift and one unmanned. This provides 2.8x the productivity of a standalone machine with a shuttle table. It can also be utilized for single or multiple machine cells. The second approach to automation is a Flexible Manufacturing System (FMS). An FMS offers the greatest opportunity to run unattended (machine paces system) because it enables you to use variable material types and thickness while running unmanned. The design of an FMS includes multiple material loading shelves where you can store and load material into a single or multiple laser-cutting machines. It is most applicable for frequent material changes, such as, a job shop environment or OEM with small batch production. Machines with an FMS typically offer approximately 92% beam on-time with 14.7 hours of cutting per day when running one manned and one unmanned shift per day. 3. What should your initial configuration look like? Most laser-cutting automation is modular in design which enables you to modify your configuration as your needs change, including the number of machines within the cell. Based on this flexibility, near-term needs should be the primary criteria in setting up your system. There are five key considerations when designing a system. What type of material storage is required? How many machines do you need in the cell? What needs to be considered for the material transfer system? How will you control the automation system? What type of material unload system is required? Material Storage. A variety of loading tables and material storage shelves are available for automated systems. A load/unload system utilizes a single load table which can be fixed, or a scissor-lift design to accommodate more material. You need to specify a design with enough capacity to run unattended for your desired, unmanned timeframe (for example, overnight). An FMS offers the flexibility to store and load different material into your automated system. A single material type and thickness will be stored on each shelf. The shelves are stacked into a tower configuration. Shelves have individual weight limitations and total capacities for each tower. Depending on the manufacturer, there are a variety of tower designs with, for example; five shelves, ten shelves or twenty shelves. For many manufacturers towers can be grouped for greater capacity. Number of Machines. I suggest you rely on your machine manufacturer to help specify the number of machines required for your workload. As we previously discussed, the increase in throughput is dramatic, and although you always want to design a system with a little over capacity, you do not need to over build your system and tie up operating capital unnecessarily. Remember that most systems are modular, and if your capacity requirements grow, you can easily add machines at a later date. But not all automation systems allow for expansion, some compact systems are for single machine utilization. It is important to establish if more machines later on is an option so you can identify the proper automation system for expansion. As you add machines to the automation system, you will need to extend rails and other components that carry the material transfer unit to each machine and the unload station or tower. Material Transfer (traverser). The two main considerations when contemplating material transfer is the maximum weight of the sheets you want to automate and if you require parts sorting after cutting the worksheet. All systems have limitations in terms of worksheet capacity (size and thickness). Many of today’s systems have a maximum capacity for a 1” sheet of mild steel. Depending on the system design, you may be able to load single sheets into a machine without using the traverser. This flexibility permits you to store and automatically load only sheet sizes commonly used and load over capacity sheets or remnants separately. Traversers utilize a variety of methods to transfer sheets of material including suction cups and rake (fork) designs. Parts sorting is a relatively new and interesting option when designing an automation system. There are a variety of designs that enable you to separate the cut parts from the scrap skeleton. Cut parts can be placed on an offload table and the skeleton can be placed on a different table or in a bin. Automated System Control. In addition to programming geometry and nesting, an automation system will utilize a Cell Controller or Management Line Controller, depending on the sophistication of your system. A load/unload system only requires a basic Cell Controller unit that loads material as the previous sheet finishes the processing cycle. It is a relatively simple device that sequentially loads programs to cut on the machine. More advanced controllers can be utilized for load/unloads and are required for an FMS that is a more sophisticated automation system. The Management Line Controller handles all of the production management functions, enabling programs to be continually fed to the laser-cutting machines. It will manage raw materials inventory and can keep track of partial sheet storage. Programs are prioritized through the scheduling function. The system loads and unloads up to 4 machines by sending the appropriate material and program to the next available machine, according to parameters selected. A Management Line Controller can provide production data including what was cut, when it was cut and how long it took to cut. Material Unload. Similar to material storage and loading options, there are many possible configurations to handling completed sheets. There are a variety of both fixed and scissor-lift tables available. It is not uncommon to utilize multiple offload tables so like-parts can be stacked. The line controller can direct the traverser with specific parts to a particular table. Tables can be on a rail system so they can be pulled from the cell for unloading without endangering operators. Safety fences and interlocks are a major topic that we will not cover in this article, but is generally specified by the machine manufacturers to comply with government regulations for safety. Storage towers can also be added to an FMS that will enable separation of finished work. Configurations and capacities are similar to the variety of loading tower options. Conveyors. Conveyors allow for quick sorting of cut parts while having a small footprint. They also allow for a quick load unload with the Laser Flex automation system. This is added value to our compact automation systems. As you design your automation system, keep in mind that most companies are planning to grow and it is important that you consider this when specifying your system. Additionally, workflow layout, including material loading, unloading and other operations, should be an important consideration of your design. 4. What are the challenges you may face implementing an automation system? Implementing a laser automation system will have a dramatic effect on a company that does not have prior experience with automation. If you are incorporating existing laser machines in the system, you should not underestimate the lost production capacity during system build and integration. Consideration should be given to downstream operations relative to workflow and capacity. Skilled labor is an important component of the plan as well. System operation will require fewer operators than standalone machines, but a few skilled people are critical to oversee effective operation and maximize throughput. Training must be a core element to implementation. Production expectations should gradually ramp up as the system comes online. Once a laser automation system is fully operational, there can be a dramatic impact to downstream operations, such as bending and welding. In fabricating facilities where the laser-cutting operation has been a bottleneck, the limiting factor effecting throughput can be transferred to other operations. If capacity for those operations is not immediately increased, how will you handle laser-cut workpieces waiting for secondary operations? Initially you may need to pace the lasers based on a pull approach from bending or welding. A final consideration when implementing your first automation system is the attitude of everyone affected by the system. Employees may fear for their job security, or not be willing to lose overtime. A certain amount of buy-in helps make a major investment like this more successful. A laser-cutting automation system is an important and impactful step for a fabricator. Choosing a partner that you feel comfortable working with, and you can rely on over the life of your system, will help you be successful and can make all the difference in meeting your expectations. 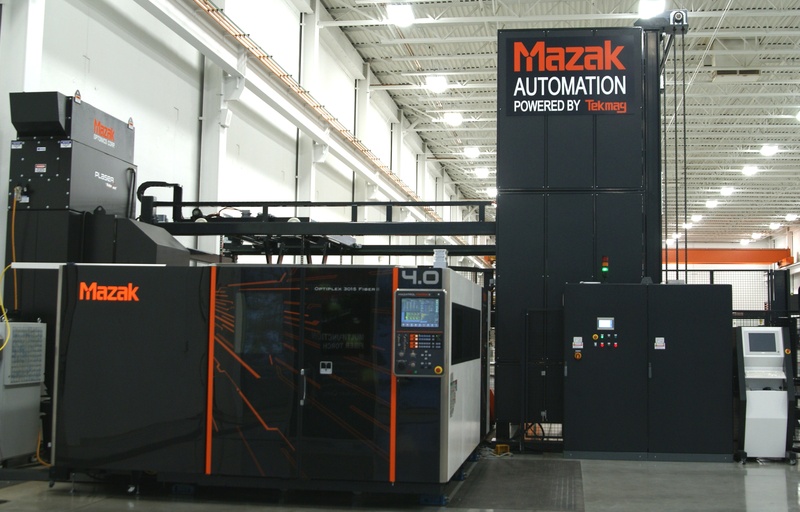 McIntosh explains, “Mazak takes the partnership approach with customers when it comes to providing automation solutions. We will work together to create the ideal automation system that will best fit each customer’s needs through production and lead time. Mazak promises to keep up with the trends and bring the best solutions”.